Keep the contents of your bottle colder for longer with this 20 oz. bottle bag insulator. Measuring 6 3/4"H, this handy item is made of laminated open-cell foam and features a swivel clip and a belt loop for easy use on the go. Secure a snug fit with the drawstring closure. It is available in several colors and can be customized (transfer, silkscreen or four-color process) for maximum brand exposure on a product that will promote proper hydration. 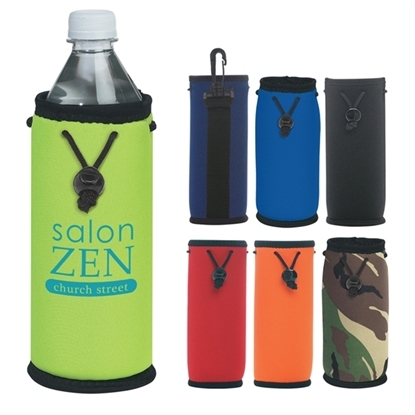 Mypromotionalpens.com offers the largest and best priced selection in Promotional Bottle Bags. We will price compete and we won't be under sold. Let our graphic designers make your personalized Bottle Bags standout above the crowd at no charge. We won't stop until you are completely satisfied with your custom Bottle Bags art proof.Use category search filters on your left to help narrow your search to find exactly what you are looking for.